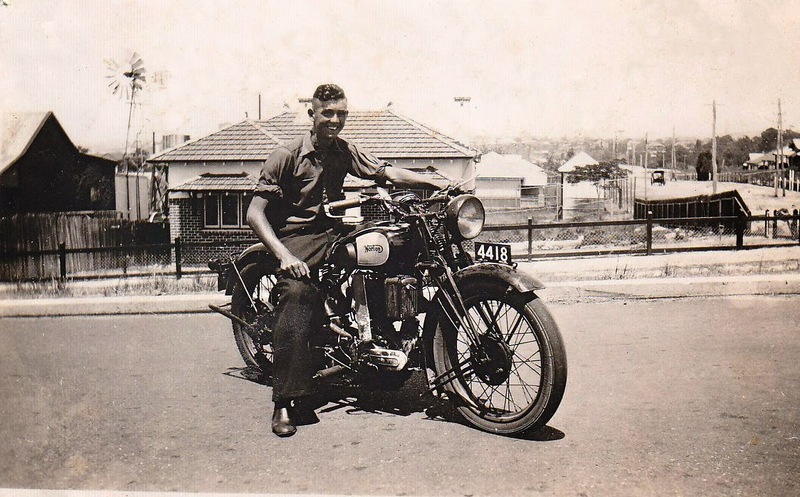 -Adam in Australia- I have recently came across this photo of my recently deceased grandfather on his Norton motorcycle. The photo was taken in (I have been told) 1932, in Northam, Western Australia. -SG- I think I can just see enough to recognise the original bike as a '27 or perhaps early '28 Model 18. This is because of the oil pump fitted to the magneto drive cover and, just visible, the clamps holding the gear change mechanism to the rear down tube. Updating the appearance of flat tank bikes by putting more modern tanks on them was quite popular in UK at the time and a few companies made special tanks for the purpose, but this one looks like a regular Norton tank from one of their early thirties range which would not have been easy to fit due to basic frame and tank mounting differences. Note the home brewed cover for the push rods and the very slick front tyre!